Qualcomm's new Snapdragon X24 LTE modem is the fastest, most advanced 4G chip on the planet. Or, at least, Qualcomm hopes it will be by the time it's in your next smartphone. Based on a 7nm fabrication process (yes, seven nanometers), the X24 LTE modem is the world's first Category 20 LTE modem and supports an absolutely bonkers 2Gbps max download speed by aggregating up to seven carrier bands. It also uses advanced massive MIMO and Licensed Assisted Access tech to help achieve these figures. 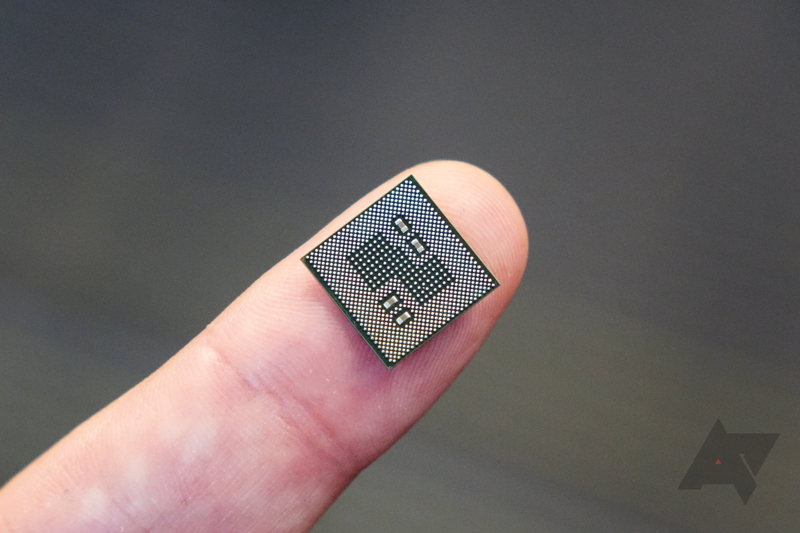 Aside from being the first commercial product announced to use a 7nm fab, the small process size should also make it Qualcomm's - and thus, quite likely the world's - most efficient LTE modem ever. Now, you won't likely ever see that 2Gbps number in reality. Or really, anything close to it. But as Qualcomm pointed out to us in its presentation on the chip in San Diego last week, it's the underlying technologies making those speeds possible that really matter. With new features like FD-MIMO, a "massive MIMO" technology that is a key part of 5G, along with the aforementioned support for aggregating up to seven carriers bands, end users will still see real performance benefits on networks that utilize these things. The end result? Higher peak speeds, even on a congested network, which means less time your smartphone has to spend using all that power to sustain an active connection. In short, that means faster downloads and reduced power consumption. Which, I think we can agree, are both desirable. Speaking to Qualcomm, we learned that while the chip is being demonstrated in Barcelona at Mobile World Congress later this month, the X24 won't actually be commercially available until the end of the year - and that's just in standalone configuration. The X24 modem won't make it into a smartphone until 2019, so no: you won't be seeing this thing in your shiny new Snapdragon 845 device. Think more like Snapdragon 850 (or whatever they call it). So, how does this new, bonkers-fast LTE modem fit in with Qualcomm's strategy to launch its X50 5G modem next year? Qualcomm wasn't really offering us many details here, but my takeaway is that it's going to be down to the choices of its carrier and handset partners to decide which chip is the best fit for them. Most likely, in many markets, operators and handset makers will opt for the X24 LTE modem because 5G networks will take much longer to deploy in most of the world versus the handful of countries where some carriers are pushing to launch them as quickly as possible. After all, why pay for the fancy 5G modem (which will almost certainly come at a hefty cost premium) if you don't need it? Even here in America, it seems possible that we'll see a fragmentation of smartphone SKUs based on radios as 5G networks begin to roll out in 2019 - not dissimilar to the early 4G days. Sprint's 5G network, set to launch in the first half of next year, utilizes a different part of the spectrum than AT&T's will, for example, and so it may require a specialized RF front-end solution paired with Qualcomm's X50 modem on handsets. Meanwhile, Verizon hasn't even announced plans for a mobile 5G network at this point, and so it's possible the carrier will have no need for the X50 modem next year, and could instead choose the likely-cheaper X24 solution for its next-generation phones. This is all, of course, speculation. But the fact that Qualcomm has announced this modem at all shows that it believes there's going to be demand for an advanced LTE solution in smartphones next year that does not include 5G connectivity, and that seems like a reasonable prediction to me. For more details, check out the press release below. SAN DIEGO — February 14, 2018 — Qualcomm Incorporated (NASDAQ: QCOM) today announced that its subsidiary, Qualcomm Technologies, Inc., has started sampling the Qualcomm® Snapdragon™ X24 LTE modem, the world’s first announced Category 20 LTE modem supporting up to 2 gigabits per second (Gbps) download speeds, and the first-announced chip built on a leading-edge 7 nanometer FinFET process. It is the Company’s eighth generation LTE multimode modem and third generation Gigabit LTE solution, featuring the most advanced cellular features of any commercially available 4G LTE modem to date, and strengthening the LTE foundation for future 5G NR multimode devices and networks. The Snapdragon X24 LTE modem will be featured in a live demonstration at Mobile World Congress Barcelona in conjunction with Ericsson, Telstra and NETGEAR.